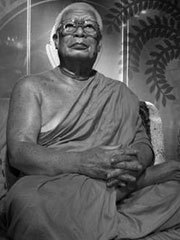 Buddhadasa Bhikkhu (Thai: พุทธทาสภิกขุ, May 27 1906 — May 25 1993) was one of the most influential Theravada Buddhist monks of the 20th century. Known as an innovative interpreter of Buddhist beliefs, Buddhadasa helped reform Buddhism in his home country of Thailand and inspired persons such as Pridi Phanomyong, leader of that country’s 1932 revolution, and the Thai social activists of the 1960s. Born in 1906 as Nguam Panid in Phumriang (Chaiya district) in southern Thailand, Buddhadasa Bhikkhu became a bhikkhu or Buddhist monk in 1926. As was expected of young monks at the time, he went to Bangkok to study. However, he found the wats (temples) there dirty, crowded, and, most troubling to him, corrupt. As a result, he returned to his hometown and moved into an abandoned temple. At the temple, Buddhadasa practiced a simple or pristine form of Buddhism by getting to the heart of the Buddha’s message of doing wholesome actions, avoiding harmful actions, and purifying and training the mind. As such, he tried to avoid the ritualism and internal politics which dominated Thai Buddhism at the time. His ability to explain complex philosophical and religious ideas in the Thai vernacular soon attracted many people to his temple. In 1932, Buddhadasa founded Wat Suan Mokkh («The Garden of Liberation»), a forest Dhamma Center and Buddhist temple in Chaiya, Southern Thailand dedicated to vipassana or insight meditation. Buddhadasa focused especially on anapanasati or meditation through mindfulness of breathing. Buddhadasa based his practice on extensive research of the Pali texts, the Buddha‘s discourses (Sutta Pitaka), and personal experiment and practice. In his later years, Buddhadasa’s teachings attracted a number of foreign students to his temple. He also held numerous conversations with leading scholars and clergy of other religions, such as Christianity. His aim with these talks was to show that when one cuts to the heart of each religion, all religions are the same. Shortly before his death in 1993, he established an International Dhamma Hermitage Center at his temple to aid in the teaching of Buddhism and vipassana meditation to foreigners.